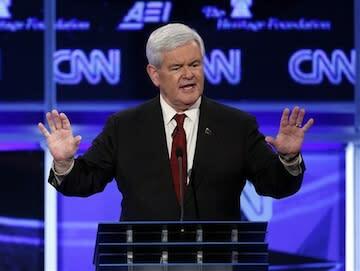 What would Gingrich’s plan for dealing with illegal immigration look like? Former House Speaker Newt Gingrich became the first Republican candidate for the presidential nomination to explicitly spell out how he would deal with the estimated 11 million people living in the United States without legal immigration status at Tuesday night's debate. "If you've been here 25 years and you got three kids and two grandkids, you've been paying taxes and obeying the law, you belong to a local church, I don't think we're going to separate you from your family, uproot you forcefully and kick you out," Gingrich said, adding that he was willing to "take the heat" for advocating a more "humane" approach on the issue. Gingrich put forth two ideas--an employer-controlled guest worker program and juries of local citizens who would review the cases of illegal immigrants and decide which of them would get to stay. Gingrich's first idea is called a "red card" program, and is the brainchild of Helen Krieble. Employers would circumvent the immigration system's bureaucracy and give out temporary guest worker visas to immigrants that they would fund. Those immigrants would only be allowed to live in the United States as long as they were employed with their sponsor. If they had children while in America, those children would not be granted automatic citizenship under the 14th amendment, The Washington Post's Suzy Khimm explains. According to Reihan Salam at National Review, the plan is meant to address the plight of immigrants who don't actually want to become U.S. citizens. These immigrants want to send money back to their home country to provide a better life for their families, and eventually return, Krieble hypothesizes. As border security has ramped up dramatically over the past five years, many migrants who in the past would come to the United States each picking season and then returned home are now staying in America. The red card program would legalize that circular migration--providing farms and other immigrant-dependent employers with labor without forcing those workers into illegality. But critics say the program would create a "second class" of psuedo-citizens who would be too dependent on their employers and vulnerable to abuse. The other part of Gingrich's plan would give local control over deportation proceedings. "Once you've put every piece in place, which includes the guest worker program [and tougher border security], you need something like a World War II Selective Service Board that, frankly, reviews the people who are here," Gingrich said. If a jury decided an illegal immigrant should stay, he or she would be granted a red card or some form of non-permanent resident legal status. That means that even though the person no longer has an illegal immigration status, he or she may never get a green card or become a citizen, and could be forced to leave the country if an employer doesn't sponsor him or her. Currently, the country's immigration system offers few pathways for low-skilled immigrants to come over legally. People can get visas if a member of their immediate family is a citizen (though wait times stretch for years), or if an employer sponsors them for an H1-B visa, which are exclusively for high-skilled workers. Like all of the GOP candidates, Gingrich said the government must first "control the border" before any other immigration action can be taken. It's worth noting here that apprehensions on the Southern border are at a 40-year low right now, in part because of an increase in Border Patrol officers and in part because the stagnant American economy is attracting fewer migrant workers.